There have been two important reforms announced, one in the EU and other in the IMF, that many investors may have missed due to the carnage in the markets. While the economic challenges that Europe faces remain potent, the refugee problem appears more pressing. Tomorrow the flash January PMIs from the eurozone are expected to slip a little, but the composite will likely remain near the multi-year high matched in December. This suggests growth is steady. The EU prides itself on its rules-based regime. One of the rules that makes it difficult to deal with the flood of refugees and asylum-seekers calls for the country of initial entry is responsible. Given where the refugees are fleeing, Italy and Greece are often the first country of entry but are ill-positioned to cope with expenses. Greece's travails are well appreciated. Italy, which has kept its budget deficit at 3% of GDP or lower for the past three years, is under pressure from the EU to reduce its debt levels. Reports suggest that last year 850k asylum seekers flocked to Greece, and another 200k went to Italy. Refugees are to be registered (largely a photographed and fingerprinted) and the point of embarkation is to provide the welfare. However, given the poor conditions in Greece and Italy, and better conditions elsewhere, the system has been gamed. Many refugees are reluctant to be registered in Greece and Italy. Local officials often see this in their interest as well. Migrants registered in one country and found in another EU country can be sent back to the first country. Since 2003, for example, reports suggest that the UK has sent 12,000 asylum-seekers back to the country of initial entry to the EU. However, many countries do not appear to bother as it can be time-consuming and costly. One study found that in 2013, only 16k of a 76k requests acted upon. Europe is going to abandon the so-called "Dublin Regulation" that makes the country of entry responsible. In some ways, Germany made the rules moot by welcoming hundreds of thousands of refugees. This would seem to forfeit Germany's right to send the refugees back to Greece or Italy. It is not clear what rules will be adopted to replace the current rules, but greater burden sharing is the only outcome that makes sense. These and other reforms will likely be announced in March. At the same time, the UK proposal to delay giving welfare to new immigrants as part of the reforms is finding support among other EU countries who face pressure from the EU reduce deficits and debt. Ironically, then the refugee crisis may pave the ground for an agreement, likely in March, that will allow UK's Cameron to claim victory and campaign for the UK to remain in the EU. The second important reform is at the IMF. It will end the program that allowed larger than usual loans to a country when its default would threaten other countries. It was this rule that allowed the IMF to lend 30 bln euros to Greece over three years starting in 2010. The IMF's executive board dropped the "systemic" exception earlier this week. 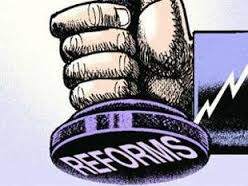 More reforms could be announced as early as next week. Some of the reforms will likely have been made possible by the US budget agreement at the end of last year, which included Congressional approval of the new and higher quotas at the IMF. In fact, the end of the "systemic exception" was part of the deal. The US Treasury committed itself to lobbying for the change. One of the implications of this rule change is that the IMF will likely push more vigorously for debt restructuring. This has implications for Greece. Ironically, Greece would prefer not to have the IMF involved with the latest aid package. Germany and other European creditors are more keen for the IMF to participate. Yet the IMF is insisting on greater debt relief for Greece than many of the official creditors want to offer. At the same time, a new reform drive will likely bolster Lagarde’s chances of securing the second term at the helm of the IMF for which she is apparently campaigning. Several European countries voiced their support earlier today as the selection process formally begins. Her term expires in July. While Lagarde is widely respected among emerging market countries, there is a desire for the top post to no longer be a European prerogative. Barring a worsening of her legal woes in France, where she will be tried for alleged negligence when she was the French Finance Minister, it will difficult to unseat her. Often the developing countries fail to unite behind a single alternative candidate.